Panasonic released a video featuring large-screen solutions for gold standard venues of sports and entertainment in North America to enhance the fan experience. The video highlights the reasons Panasonic became the partner choice for such venues as Indianapolis Motor Speedway, Churchill Downs and L.A. Live. "There's nothing like the energy, emotion and sensory experience of a live event. But that's just not enough anymore. The real-time data, the interviews, the social media component, these are things that simply have to be incorporated into the live experience to get people off their couches and into the stadiums or arena." "The reason Panasonic quickly became the partner of choice for venues looking to create a completely immersive, engaging experience for their fans is that Panasonic partners with them to fully understand their needs, and the unique challenges they face in their venue. Then, together, Panasonic creates a holistic, custom solution that addresses their concerns and meets their needs in a way that no one else can." Panasonic Solutions extend "from Glass to Screen". They cover what's captured by Panasonic professional video cameras and lenses to what appears on the video boards in the venue and all the elements in between, including switchers and monitors, control room design, security systems, content creation, management and maintenance. No one in the industry can offer a more comprehensive technology package than Panasonic. At the Indianapolis Motor Speedway, the largest sports venue in the world with a 2.5-mile oval, Panasonic installed 20 large to moderately sized LED video boards that provide views to 98% of the spectators. Panasonic also installed a control room to deliver real-time stats, data and rich content to each of those 20 boards. "With high definition video equipment, we could switch from camera angles on the race track to the in-car camera to see what the driver is going through on the track real time, in addition to being able to add all the information on fans' wants" said Doug Boles, President of Indianapolis Motor Speedway in the video. Churchill Downs, home of the Kentucky Derby, is another unique gold-standard venue that needed to preserve the history and legacy of the famous facility. It also needed to provide a view of the race to 75,000 people in the infield who had never actually been able to see the action on the track before. 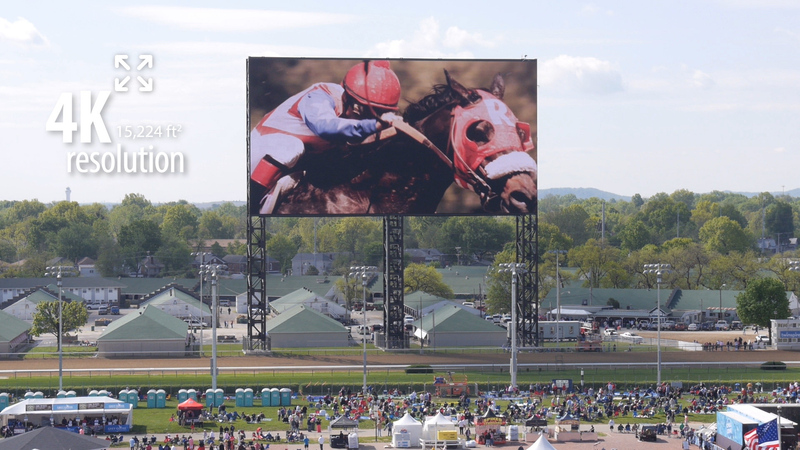 Panasonic installed the world's largest 4K video board measuring 171-feet wide by 90-feet tall with a state-of-the-art sound system. 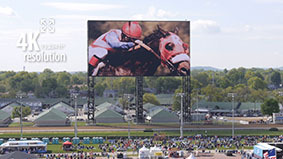 At the Kentucky Derby the entire venue was riveted to the board during the fastest 2 minutes in sport. The work at L.A. Live and STAPLES Center was critically important to Panasonic. It installed a fully comprehensive solution including security solutions, large-screen displays, projectors, POS systems and TVs. "We wanted to have one technology partner that could help not just from a hardware perspective, but also from a service standpoint. That is something that is unique with Panasonic", said, Russell Silvers, Senior Vice President, Partnership Activation, AEG in the video. Jim Doyle spoke about solutions for the future. "At Panasonic, we're very focused on creating the future. And to us, to our fans and to our customers and our sponsors, the future is about Connected Experiences. Imagine connecting multiple venues in different locations in real time, and staging a virtual concert, for example, where you're now bringing full crowds into venues that would otherwise be empty on a particular date. The possibilities for delivering enhanced experiences, revenue generation and community engagement are virtually unprecedented." "Panasonic hopes to help build a better world by fostering a stronger, trust-based partnership with its customers and by making these solutions available across the world," concluded Yasuji Enokido, President of Panasonic Corporation's AVC Networks Company. Panasonic Enterprise Solutions has also installed large-screen LED displays at the Charlotte Motor Speedway which hosts NASCAR, Ohio State University, Lincoln Financial Field (the NFL team Philadelphia Eagles' stadium) and Estadio Azteca in Mexico City.